Six Year 13 students have received conditional offers of places at Oxford and Cambridge Universities to start in October this year. Max Hadley, has an offer to study Physics and Philosophy at Balliol College, Oxford and needs to get A*, A, A in his A levels. George Hobart, has an offer to study Physics and Philosophy at Brasenose College, Oxford and also needs A*, A, A.
Adam Hussain has an offer to study Engineering (Chemical Engineering) at Gonville & Caius, Cambridge requiring him to get A*, A*, A.
Thomas Parkin has an offer to study Psychology, Philosophy and Linguistics at St Catharine's, Oxford, and needs A*, A, A.
Harry Rogers has an offer to study Natural Sciences at St John's College, Cambridge, and needs A*, A*, A to qualify. Joey Xiang has an offer to study Mathematics also at St John's College, Cambridge and also needs A*, A*, A plus a 1 in Maths tests STEP II and STEP III. 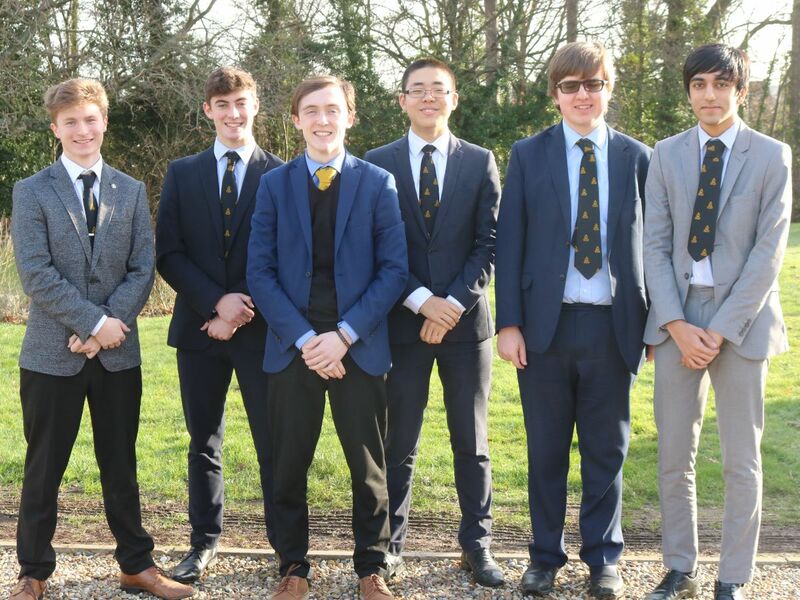 The achievements of this talented group of students are not only academic: Max is Head Boy, plays rugby for the school and competed in the Eastern Regional Final of the Rotary Club's "Youth Speaks" competition, being awarded a prize for giving the best 'Vote of Thanks'. George is Deputy Head Boy, a keen member of the Debating team, involved in the MUN and works in part time in a charity shop. Thomas plays bass guitar in the school Jazz band and Harry runs the Engineering, Maths & Physics Society. Adam has recently completed an EPQ titled "To what extent is it reasonable to say that nuclear fusion will be harnessed effectively enough in the coming decades so that fusion will have become a main energy source of the world by 2100?" Joey is in the Army Cadets outside school and helps with Paired Numeracy inside school, helping younger pupils with their maths skills. Joey came into year 10 at TBSHS after moving from Beijing in 2015, and found living and attending school in the UK a completely new experience. He had to learn English and adapt to the British weather, both of which he found challenging. Fiona Price, TBSHS Oxbridge Co-ordinator, commented, “We are very proud of the achievements of these students who have worked exceptionally hard to gain these offers. They have made full use of the all the support offered by our staff and also exploited numerous enrichment opportunities to develop their academic ability, such as involvement with societies, external speakers, summer schools, and wider reading. We now wish them all the best in obtaining the grades required to secure their places."